Multi-layered Anti Spyware and Anti Virus protection checks each web page, email and files/registry on your system and eliminates/ blocks threats. Protects against viruses, spyware, Trojan horses, worms, bots and rootkits. Provides continuous automatic protection against new threats. Reduced scan time with smart scanning, your pc is so light that you can work and play uninterrupted. Stops threats at point of entry with a quiet two-way firewall. Helps secure and monitor your home network. Data theft prevention keeps your sensitive personal information, like credit card numbers and passwords safe. Safely work on your PC and let us protect you from fear of Data being stolen.Use UB devise such as Pen Drive without fear as nothing malicious can execute on your PC without your permission. URL filtering blocks unwanted websites according to a highly configurable database. Protects against web-based attacks that use vulnerabilities in your browser. Block malicious websites. Safeguards you from Trojan and virus downloads on your PC without you knowing. Stops Adware. Identifies unsafe websites and suspicious sellers so you can surf and shop with confidence. Stop malicious downloads from websites. Find and block malicious links in emails or IMs. Guard against identity theft. Erase sensitive data for complete privacy. Assure confidentiality with the Secure Delete option. Boost your system performance. Clear all your, online and offline activities. Optimize your Internet Experience. Boost Your Modem Browser Speed. Increases your PC's available physical memory. It continuously monitors your computer's memory. 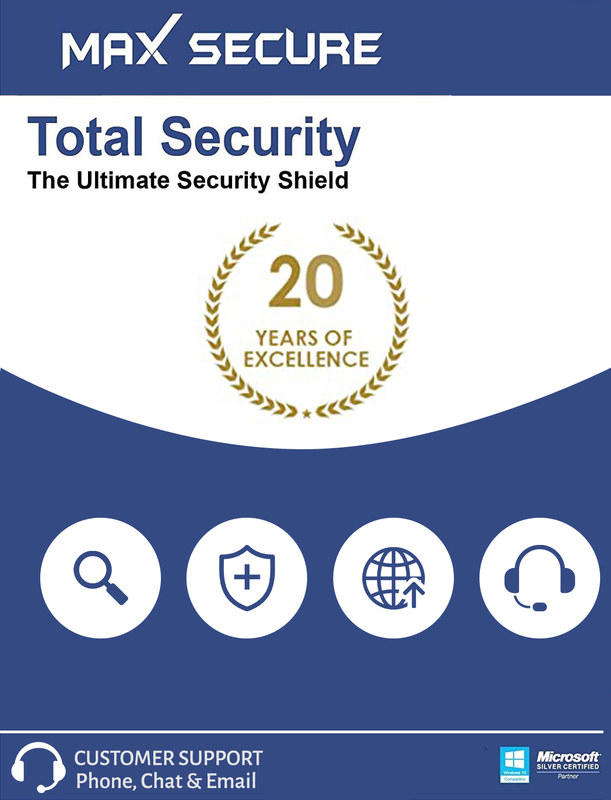 Max Secure Total Security is a most essential protection your PC needs. Multi-layered Anti Spyware and Anti Virus protection checks each web page, email and files/registry on your system and eliminates/ blocks threats. It Provides continuous automatic protection against new threats. Two way Advanced Firewall prevents unauthorized access to your PC at point of entry. Data Theft Prevention Protects your sensitive personal information, like credit card numbers and passwords safe. Parental Control allows you to control employees and children internet usage and filter what they can browse. You can surf safely with Anti-Phishing blocks malicious websites provided by default and you can add your own websites that you want to block. You can Maximize your PC performance by our Award winning registry cleaner component using which you can Safely clean, repair and optimize the Windows registry, Defrag and Registry and take Safe Back up. Privacy Protection guards against identity theft and Boosts your system performance. You can clear all your, online and offline activities. Assure confidentiality with the Secure Delete option. Internet Optimizer speeds up your Internet and RAM optimizer increases your pc available physical memory. 24x7 live chat, phone and email based support gives you access to round-the-clock technical support. Max Secure Total Security will operate on the following versions of Microsoft Windows operating systems: Windows 10, 8.1, 8, 7, Vista, XP, 2012 server, 2008 server, 2003 server 2000 (Service Pack 4) both 32 and 64 bit versions. "Just to say many, many Thanks for sorting out my mess! What a Fantastic, Amazing, Excellent, High Quality, Product! Anyone with a PC should install it. Can't recommend highly enough."